The first thing most people ask me about Saint Junia United Methodist Church is “Where is it?” I think a better question than “Where” is “Who?” Our vision of this new church is that we will become a diverse community of sinners, saints, and skeptics who join God in the renewal of all things. Our mission is to love God and our neighbors through worship, devotion, compassion, justice, and witness. We meet as a network of house churches in Birmingham. Our website is here. Our phone number is (205) 202-0680. Becoming a diverse community— Our goal is to become as diverse as the Kingdom itself. Since God shows no partiality (Acts 10:34, Galatians 2:6), and since all people are made in the image of God, our desire is to become a community in which black, white, and Latino, gay and straight, old and young, rich and poor, male and female are welcome to the table and invited to use their diverse gifts for worship and ministry. We want to be a witness to Birmingham and to the world that the Good News is for all people. …of sinners, saints, and skeptics—Martin Luther said that we are simultaneously sinners and saints, and it has been said that every saint has a past, and every sinner has a future. All of us have doubts. The first disciples followed Jesus before they ever came to believe in him, and in this community we emphasize following the way of Jesus even in the midst of doubt. Plenty of people believe, but do not act. Jesus invites us to act our way into believing. …who join God in the renewal of all things.—The Gospel is not just about getting our souls into heaven—it’s about getting heaven into our world. Salvation is about renewing our spirits, our bodies, our relationships, our schools, our neighborhoods, our society. The message of Jesus’ resurrection is that God is not through with us yet, that Jesus is still working in us, among us, and through us, and that he invites us to be part of God’s world-salvage project. Since “the renewal of all things” is a big project, it helps to break it down into five areas of our life together. Jesus said that the greatest commandments were to love God and love our neighbor. We do this both publicly (as a community) and privately (as individuals and small groups). We love God as a community through our worship, orienting our community life toward God. We love God as individuals and small groups through devotion, developing habits of the heart and mind like prayer, study, giving, and meeting together in small groups for encouragement. We love our neighbor as individuals through acts of compassion. We do ministry with others in need, and we practice how to love our families, friends, and enemies better. We love our neighbor as a community through acts of justice. We address responsible stewardship of our planet, we advocate for peace, and we challenge systemic evil in our society. 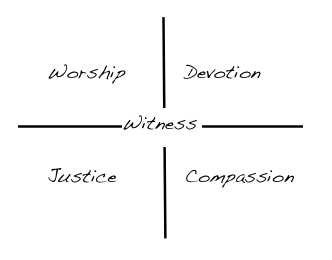 Binding all of these together is our common witness. We act this way because we believe our best picture of God is the incarnation, ministry, death, and resurrection of Jesus. We extend the invitation to others—to you—to join God in the renewal of all things, and to live the abundant life God wants for all of us. Click here if you would like to know what this stuff looks like. I’m not a member at Trinity, but I visit. I just want to know when and where to show up. Thanks, Hope! We’ll be starting informal worship gatherings at my house on July 1 at 4:30 PM. If you want to email me at dave at davebarnhart dot net, I’ll be glad to send you details. I am more than thankful and proud of you Dave! You have walked into a door bigger than all of us and your vivid intentions are enormous and ‘spot on’. You will open bigger and bigger spaces and your groups will become crowds and then they in turn can reach out. Always in my prayers. How can I find out where & when the new church is meeting? Hi, Sally! The Saint Junia website is saintjunia.org, and we’ll be updating it soon with the relevant info. Right now, the plan is for us to meet at Girls Incorporated in Crestwood at 4:30 PM on second Sundays of the month. Our first public preview service will be February 10. We’ll start weekly worship in August. I’d love to see you there!